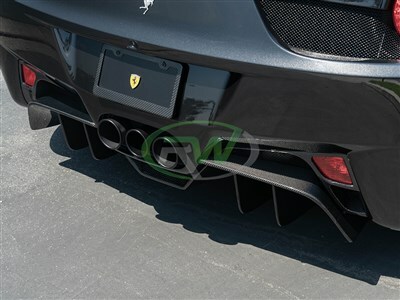 Upgrade the rear exterior appearance of your Ferrari 458 with our newest carbon fiber addition, our 3pc rear diffuser package. This package includes a 100% carbon fiber center diffuser and two carbon fiber fog light moldings. All 3pc are crafted from real, high quality 2x2 carbon fiber. After creation of the carbon pieces we complete them with a UV resistant clearcoat to make them easy to clean and impervious to sun exposure. 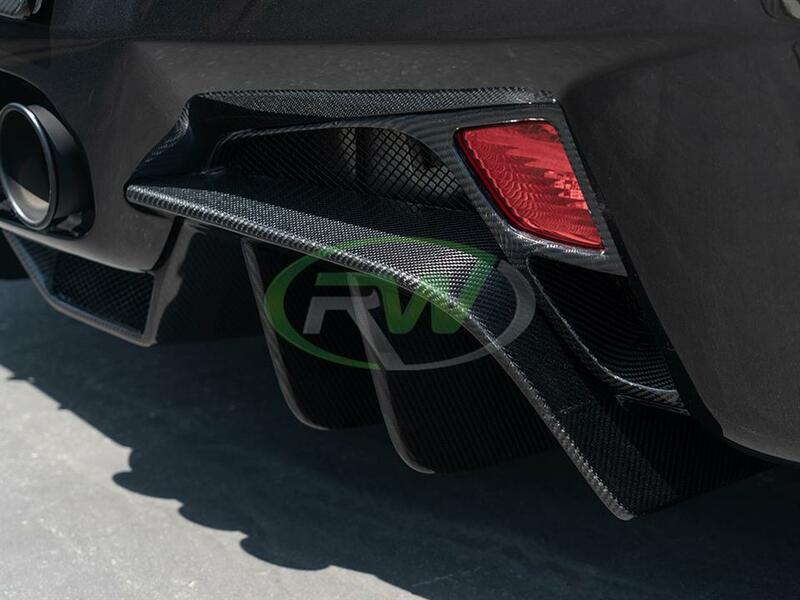 This Ferrari 458 carbon fiber diffuser fits 2010+ Ferrari 458 applications. 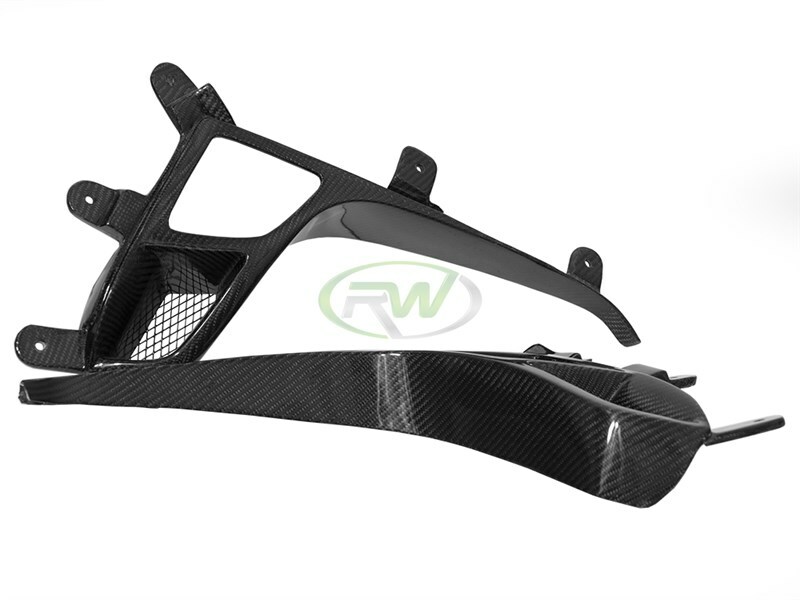 Match with RW Carbon's other exterior CF parts for a customized look without the hefty pricetag. Installation is bolt on and does not require any modifications to your vehicle. This 458 diffuser, just like all of our 458 products are hand crafted in our factory. 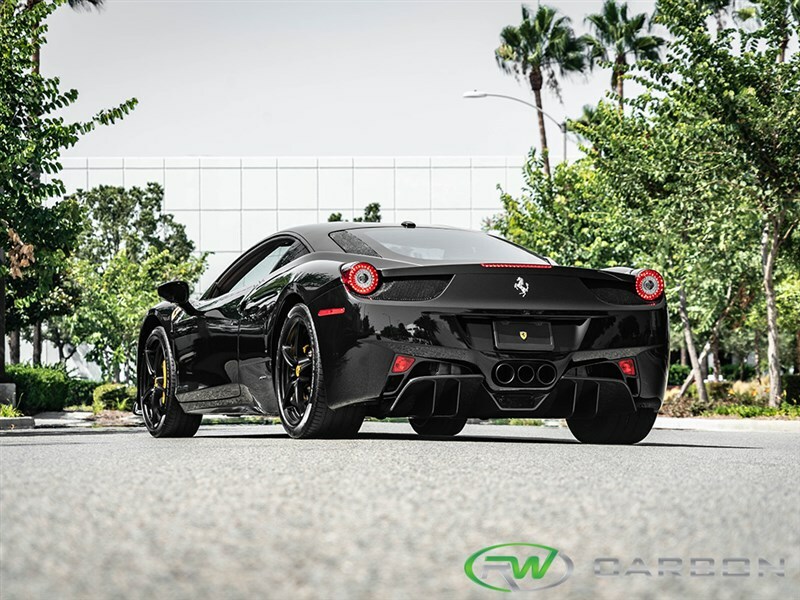 When you purchase your Ferrrai 458 carbon fiber diffuser from RW Carbon you are in good hands as all items come with our quality and fitment guarantee. 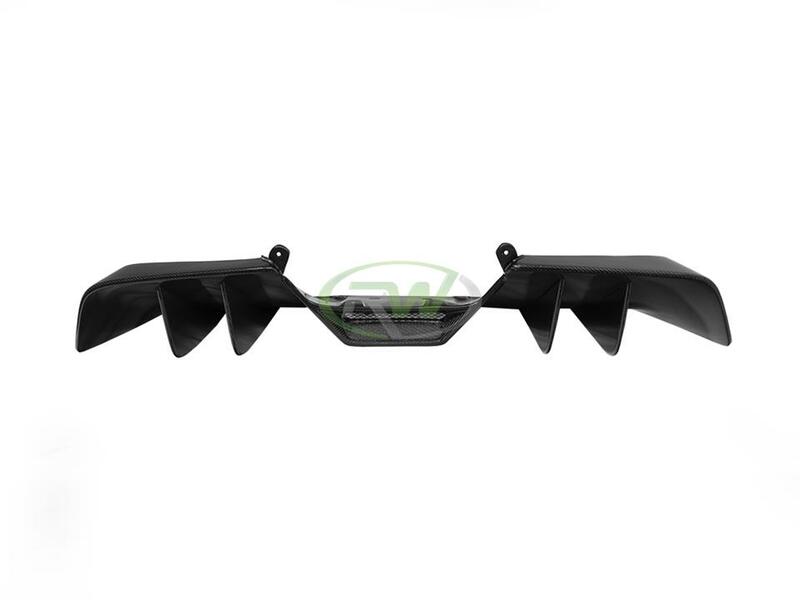 This Ferrari 458 diffuser comes in multiple pieces and is very difficult to install. Professional installation is needed to get proper fitment. If you have questions about the install process please call us at 714.328.4406. We know there are many companies out there claiming to have the best carbon fiber upgrades for your Ferrari 458. At RW Carbon we are different - We quality control every single item that we ship from our warehouses to provide you with a quality item that is free of defects. By choosing RW Carbon we make the promise to deliver a consistent, quality product that is shipped from our Southern California location, not from China. Additionally, all products shipping from our warehouse are meticulously inspected, and packaged to ensure the utmost care and provide a truly quality piece for your 458. Our products may look similar to other carbon fiber accessories on the market but they are different in the fact they have a clean weave construciton, better qualtiy carbon fiber fabric, and overall superior fitment. I have had my 458 for about 3 years now and it has been a great few years. However, recently I have been getting bored of its looks. 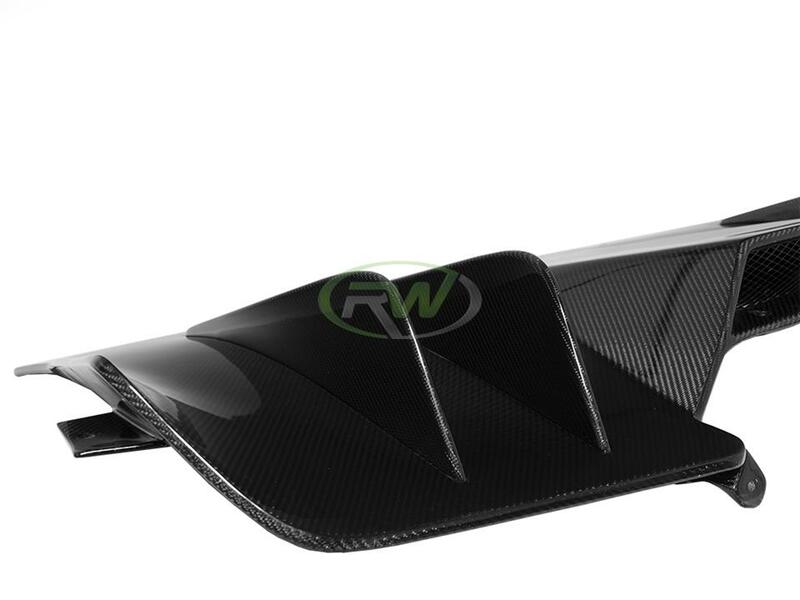 I Googled some cosmetic mods for it and came across rw carbon. Saw this diffuser and gave them a call. They said it was a new product and that is why there are no installed pics yet. I took their word for it that it would fit great and it did! The diffuser looks amazing and I fell in love with my 458 all over again. Now I have my eyes on that wing <3.